Washington Capitals owner Ted Leonsis has a huge offseason ahead of him. It starts with big decisions at the General Manager position and determining Washington’s 2014-15 head coach. Due to the obvious reasons including calling out Ovechkin publicly, mishandling of the Jaroslav Halak situation against St. Louis and the misuse of Martin Erat, Adam Oates shouldn’t be with Washington moving forward. The firing of Oates seems imminent, or at least it should be. Oates has one year remaining on his three year contract with the Capitals and McPhee’s deal runs through June 28th. “At the conclusion of Leonsis’ comprehensive review he will determine whether George McPhee will be renewed for an 18th season as Capitals general manager and whether Adam Oates returns for a third season behind the Capitals bench,” Chuck Gormley of CSN wrote. If Leonsis wants to replace McPhee, hiring a new General Manager could have to wait if he’s interested in an assistant GM that’s currently with an NHL team in the Stanley Cup playoffs. That would further delay the hiring of Washington’s next bench boss, with big names such as Barry Trotz currently on the market. Trotz should be the Capitals’ number one target for next head coach. 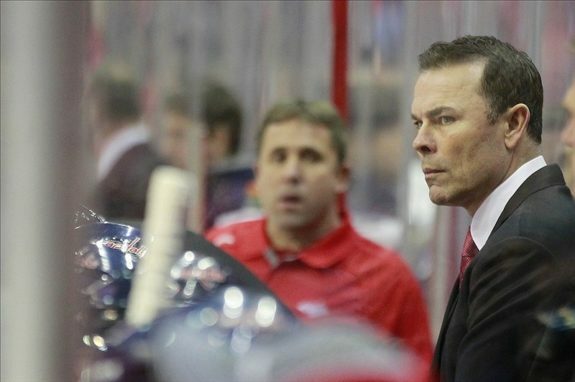 The Capitals should surely go outside the organization for their next coach. Don’t hire a former player just for the name. Current Hershey Bears coach Mike Haviland interviewed for the Caps head coach position when Oates was hired. Although many media and fans have stated Leonsis should clean house, I’m offering a different view. McPhee should stay GM and Oates should be fired. McPhee had an outstanding trade deadline, there’s no way of saying he didn’t. He was able to move two unhappy players and their contracts for some picks and a young power forward prospect in Chris Brown. McPhee and his scouts have established a good sense of trust and are one of the best drafting teams in the NHL. Young forward Andre Burakovsky and defenseman Madison Bowey could make an impact in Washington not before too long. McPhee shouldn’t be blamed completely on the Erat trade. Erat never was given a clear shot to impress in Washington by Oates, often skating on the fourth line or sitting in the press box on game days. Even though Oates mismanaged the entire situation with the former Nashville Predators forward, the trading of Filip Forsberg was still a monumental mistake. McPhee has put together one of the best power play units in the league, with Washington finishing tied for first in power play percentage (23.4%) in the regular season. The Capitals netted 68 goals on the man advantage, with Captain Alex Ovechkin converting 24 of their tallies on the power play. Ovechkin’s 24 goals when the opponent is shorthanded were the most in the NHL since Tampa Bay’s Steven Stamkos registered 24 PGG in the 2009-10 campaign. 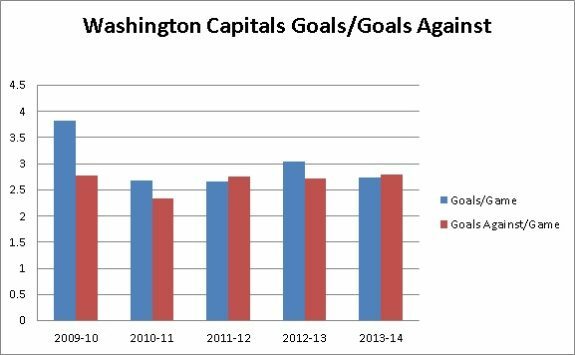 Washington’s offense has often been aided by their power play, but it is still a strength of their team. It should continue to be with a much needed improved defense. While their offense as a whole this season fell about one fourth of a goal per game, that can be attributed to playing in their own end for the majority of a game and an unlucky year for the shooting percentage of Ovechkin’s line mates on the Capitals top forward line. Along with the addition of Halak, McPhee and Washington’s scouts have given Washington stability at the goalie position. They have Braden Holtby and Philipp Grubauer under contract for next season, which could be their tandem in net. With the way Oates handled his relationship with Halak, the former St. Louis Blues and Montreal Canadiens goaltender is unlikely to return. He’ll be one of the top goalies available in free agency. McPhee also should resign forward Mikhail Grabovski, who had a strong season for the Capitals after a few season with the Toronto Maple Leafs. Grabovski has stated he wants to wait and see who the coach is and whether there are changes in management. The forward who drives puck possession would be a strong asset to have long-term, with power play ability and an overall strong player to have in your top-six. Washington has the amble cap space this summer to retain Grabovski. Jaro Halak, who will be a UFA this summer, said he wouldn’t be against returning to the #Caps. McPhee’s selection of Alex Ovechkin in the draft might be his greatest achievement since he took over the Capitals, or close to the very top. 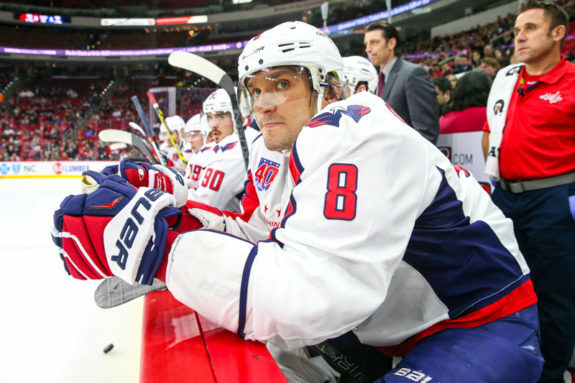 Ovechkin is usually in the top five for jersey sales every year and Capitals’ fans continue to fill the seats, accumulating hundreds of sellouts over the past eight years. The notion that Ovechkin is the problem and should be traded is ludicrous. The criticism given by McPhee is fair and warranted, but people need to see what McPhee and the Capitals have done. They’ve rebuilt the Capitals into a team that spends near the upper level of the salary cap every year, a team that sells out the majority of their games and a team that usually competes for the playoffs. The goal is to finally win the Stanley Cup, but the latter isn’t a bad fall back plan either.